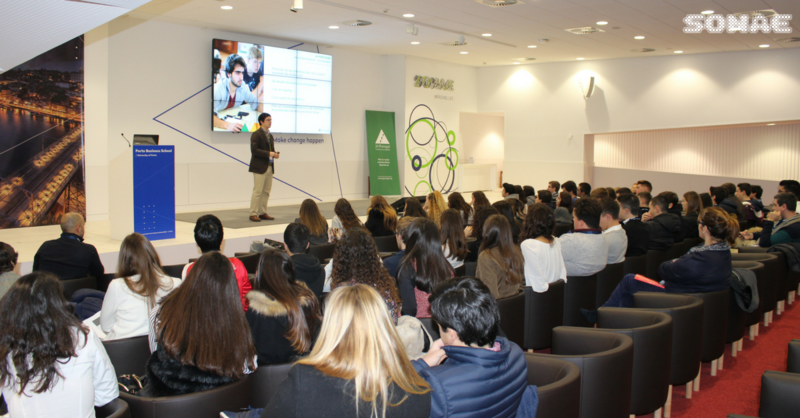 Under the auspices of the “Why Europe Matters” initiative, around 70 young students aged between 16 and 25 took part in a challenge set by the European Round Table of Industrialists together with Junior Achievement Portugal. It was with enthusiasm and sense of responsibility that our team of volunteers embraced the mission to discuss the future of Europe among the youngest. Students were invited to the Porto Business School facilities, where they worked on proposals for Europe in small teams. A strong Europe within a global context. Within these broad guidelines, students developed projects on issues including youth unemployment, terrorism, gender inequality, innovation, and sustainability. Volunteers from Sonae and SAP, guided them in the work, encouraged them to question their assumptions and helped them to develop ideas and final presentations. In the end, each team presented its proposal to the jury as well as to the other participants. Four participants were selected and will represent Portugal at the final “Why Europe Matters” conference in Brussels. Overall, the event provided the students who took part with a greater awareness of the importance of the European Union, whilst also encouraging their political involvement. The organisers and the volunteers were united in their commitment to highlight the positive impact that Europe can have on everyone’s lives, and to give the future of Europe a voice. We take with us the innovative and collaborative spirit that these students shared. This inspiring experience renewed our confidence on the strength and sustainability of the European project by highlighting youth citizenship.